Should you delay receiving your retirement benefit beyond full retirement age? 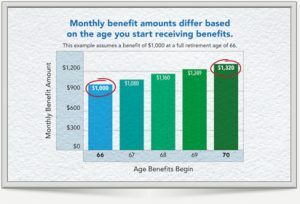 Your benefit can increase as much as 8 percent a year up to age 70! There is no additional increase if you delay beyond age 70. Ask for our information on additional strategies that may increase your retirement income and protect your assets from market fluctuations.